Here’s a picture of the beast.lol I built this float tank late 2009, and it served me well. I documented the whole build so I could help others build their own tank. If you’re looking to build a custom tank this site will still help a lot! If you’re looking for the most affordable way to have your own float tank I would definitely recommend buying a Float Tent. These things are awesome! As a bonus they are also light and easy to ship so it doesn’t matter where you are in the world. I’ve been looking EVERYWHERE for some plans. Pretty ingenious ideas. This is definitely going to save me a lot of time. Wow ! An isolation tank has been on my “pipe-dream wish-list of things that i’ll never have” for quite some time… You break it down so well, I should be able to afford to cook one of these bad boys soon. I’ve read this guide about 25 times now and I’m now about to buy the same tank you bought and begin. You’ve inspired me to get up and DO IT!!! Condensation not being a problem with this design is something that really sets this design apart from all the other DIY plans I’ve seen. Shane I just came to awareness of sensory deprivation chambers the other night, and I am determined to build my own float tank. These instructions look gold, and very easy to follow— and I would love to donate when I have completed the construction. This is actually a work in progress, I should have this site wrapped up in two weeks. I’m on it! Don’t worry the tank is done and functioning daily as of a few months ago. lol.. I went through the same thoughts as you. Be sure and like us on Facebook if you haven’t already. It’s an easy way to stay updated on our progress. thanks for your quick reply I’m jacked to see the rest of the how-to and lfoolw along going to get some friends in on this project. I like your idea for the tub the best I came up with (other than making my own fibreglass mould) was to flip a fibreglass shower body on it’s back and build a box for it. That or a horse’s trough. Dude not to mention, you looked like Joe Rogan when I clicked on your link, CHEERS!!! Your intent to make the tank available to those with limited funds is absolutely awesome, I built mine for around $1200 however your setup is much more innovative! Thanks! It turned out pretty good so I’m excited to get it online. Sweet website man, I plan on building one soon and I’ve been looking EVERYWHERE for some plans. Pretty ingenious ideas. This is definitely going to save me a lot of time. I will for sure send you some cash once I have made my tank. This site is the best I’ve ever seen. You go way out of your way to put it all together. The site is clean, easy to navigate, and simple. Thank you. I’m going to build and when I do, your site is going to be my blue print! Wow ! 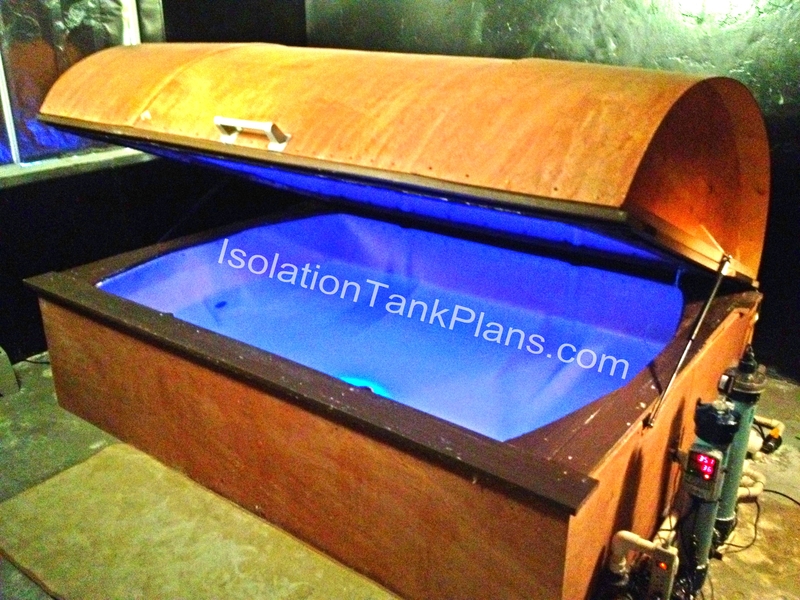 An isolation tank has been on my “pipe-dream wish-list of things that i’ll never have” for quite some time… You break it down so well, i should be able to afford to cook one of these bad boys up within the next couple of years. Thanks for sharing your ingenuity ! Awesome! I love hearing from people like you. Now that you can imagine having one, it’ll happen quick. Dude not to mention, you lokeod like Joe Rogan when I clicked on your link, CHEERS!!! Your intent to make the tank available to those with limited funds is absolutely awesome, I built mine for around $1200 however your setup is much more innovative! Great info I am looking into building a tank. I think I am going to use a plastic tank like this http://www.ntotank.com/300galowprta.html. I would like to buy a taller like a septic tank but they are a little to big. I need to be able to get it into a closet under my stairs. I will have to cut a hole on top and make a door to just climb through. I wasnt going to insulate but I seen that you wrote the heater wont keep up unless you do think it will cood down to fast after it is off. I could possibly spray foam the outside. I am going to look for a little deeper tank because at 21″ with 10″ of water might get a little closterfobic but then again when its pitch black you would never know. Shane, you are a good man. Not out to rip people off or get rich, you’re just trying to help your fellow man. I have great respect for you. I will begin building mine next week. Have you developed any new ideas? What are some of the lessons learned? I hope people donate generously. Thanks Shane and God bless. Johnny, Good to hear from you! I love your outlook. I have no intention of ripping people off, although I feel like I’m offering some real value because the learning curve on my end was countless hours and the wrong parts, which equaled about $1,000 extra.lol So I may charge about $20 for plans in the future. Seems fair right? I have a feeling charging a bit may even get more people floating because they’ll be committed. That sounds completely fair Shane. I respect what you are doing and I think more people need to experience floating. It is an amazing way to unwind in our overly fast paced lifestyles. Take care, and float on! Shane. I really just wanted to say thanks. I’ve read this guide about 25 times now and I’m now about to buy the same tank you bought and begin. You’ve inspired me to get up and DO IT!!! That’s truly is the hard part. Thank you!!! I do have general questions. How were you able to bend the wood to cover the lid? Did you pre bend it at all, or just used thin flexible wood, pin it and spray the hell out of it? As far as tank size goes. If you planned to make another model would you get a larger tank? The fact that this site has motivated a poor guy like me to save every cent I have to make this, is magic. Thank you. Wow.. awesome to hear from you! and glad you like my stuff. I was able to bend the wood, it took some finesse though. You’ll see in the plans. It’s about perfect size, not just saying that either.lol I got lucky. I would not go bigger, it’s got plenty of space. What was your total investment in this tank? Could you please give specifics on spendings? Great question. Check out some of the frequently asked questions for building this floation tank. I’d estimate the total investment is about $2,500. I did already have power tools though. Hi, im glad that i have found out about this just wondering how long is this tank in feet becuase im 6 ft 4 ? Thank you. That’s close… I mean really there is over 6’6″ of space, but your feet will hang down and relax. I had a 6’3″ friend use it fine, but there wasn’t a lot of room to spare. the tank looks badass but i am inexperienced in building and i was curious to know if there is any chance of malfunction of the electrical side of the equipment. meaning is there a safety hazard if put together wrong ? anyways this sites awesome and i look forward to buying the plans and pursuing building my own tank. I run everything through a GFCI outlet… so it shouldn’t be able to kill me no matter what happens.lol It will be the same type hazards if you were building a custom aquarium. I live in Indianapolis, which doesn’t have a float tank within 300 miles of here so I thought about building my own. However, I’m renting right now and will be building this in my garage (which has an outside facet). However, I noticed that you have “plumbing links” on this page so what I want to know before I buy is does this have to be built into your home’s plumbing system? For drainage, I was just going to drag a line out to the storm drain in the street. That’s what I was faced with too… Build man! you won’t regret it. The temperature thing isn’t a problem in floats under a couple hours. Even more probably. I heat the air in the room too. As far as commercial basis I’m just not sure. You might research Bromine and Chlorine in salt situations. Or call float centers and see how they keep their water clean. Good luck! The reason I turn off the heater when I float is noise. They pump puts out a humm that would be annoying. I insulated the tank enough that it holds temperature well. I have heard of people using water bed heaters during their floats, so that is an option. I haven’t used a water bed heater pump, so let me know if you decide to try it. I was just wondering, is this tank designed for disassembly? If I were to move house after having built it how much hassle would this cause? Hey, I was reading these comments and was wondering how you keep condensation from occurring? Especially if you turn off the water heater? It was my understanding that the air in the tank has to be slightly warmer than the water or drops will occur… Do you have this problem or a way you solve this? Thanks! I haven’t had much problem with this. The curved lid seems to help the water slide down the sides. There also seems to be plenty of fresh air. For sure.. I would leave yourself atleast 10′ x 8′ That’s total minimum for the design. You could always tweek the design and put the components somewhere else.